Yamaha is first to the punch with its model year 2015 lineup. While there are lots of cool sleds to look at, we're focusing on the SR Viper MTX -- Yamaha's first new premium mountain sled since the Nytro MTX was released in 2008. Yamaha is in its second year of a five-year platform-sharing agreement with Arctic Cat. The 2015 Yamaha SR Viper MTX is based on the ProClimb platform which is a perfect fit for the Genesis 3-cylinder 4-stroke engine. Yamaha's exclusive YVXR clutching set this sled apart from other 4-stroke mountain sleds. 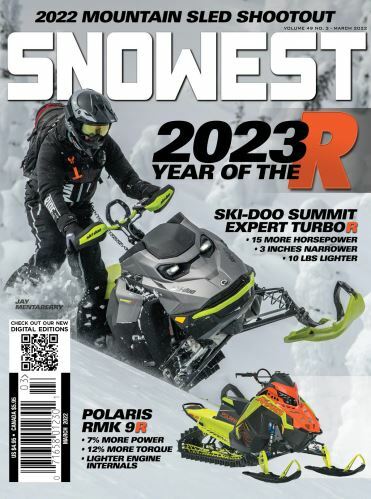 We had the chance to ride these sleds in the mountains of western Wyoming in January (see video below) and, while you'll have to wait for the March issue of SnoWest Magazine for the full scoop, this sled is going to be a hit. It is without a doubt the best-handling, best-performing 4-stoke mountain sled Yamaha has produced--by far. The 2015 SR Viper MTX will be avaialble in three versions (MTX, MTX SE and MTX LE) and two track lengths (153 and 162) and four colors (black/grey MTX standard, red/white MTX SE, blue/white MTX SE and blue/orange MTX LE). The 15x2.6 Power Claw track will come on all models, both 153 and 162. The lightweight rear suspenion is a dual shock skid with Fox shocks (SE and LE models; HPG coil shocks on standard) and extrovert drivers. The SR Viper MTX gets a new mountain seat with narrower profile (Yamaha exclusive) that is tapered towards the front and shorter than the standard SR Viper seat. The SR Viper MTX sleds also get vertical steering with a mountain bar/strap controls that offer great rider ergonomics. A new single-keel mountain ski will grace the 2015 SR Viper MTX, and the front suspension is an adjustable 38 to 39 inch center-to-center width. Fox Float 3 hold the front end up with 9 inches of travel on the SE and LE models while HPG coil-over shocks fit the standard MTX. The SR Viper MTX also features a 10-gallon fuel tank, magnesium chaincase cover without the Arctic Cat oil reservoir). The Ski-Doo Summit SP 600 and Polaris 600 Pro RMK.